DELFT POTTERY and the term DELFT-WARE refer to a specific decorative style that originated in the town of Delft in Holland. Potteries in the area making mostly simply-shaped earthenware vases, urns, plates or tiles date as far back as the early 16thC. Most Delftware are Blue & White Chinoiserie designs and were in direct imitation to the widely popular Chinese imports to Europe of that era. Some examples are Polychrome (i.e. of many colors), but almost always on a classic thick white glazed background. Deft Chinoiserie were a Europeanized form of Chinese exports of the time and were designed or modelled with Western tastes in mind. Delft as a style is still quite popular these days. Pretty souvenirs from Holland or other decorative objects are produced in droves. Although Delft’s Dutch origins suggest that this was the only place that Delft Ware was produced, this is far from true. Potteries in other countries were also very prolific and early adopters of this style, mostly ca mid-18thC onwards, and especially in the UK - termed English Deftware, very often in polychrome designs - but also in France and Italy. Even Japanese potters & kilns that had already developed a rich industry using porcelain, which by default is superior to earthenware, imitated designs made in Holland and exported them to Europe. Nowadays, most Delft designs are typical scenes or shapes that are reminders of Holland’s countryside and Dutch folklore. Many of these are actually mass produced in China and may have had some decorative finishing touches at one of the numerous workshops near their place of sale. Such examples of Delftware is specifically destined for the tourist trade and in most cases are of good quality, but not of any significant appraisal value. However, some companies have continued the tradition of making pottery in the old manner, both in using tested techniques or materials and also in the true ancient Delft design style. The vast majority of these are often accurate and fine reproductions of specimens found in Museums or fine private collections and very desirable by collectors, even though some may be fairly recent. Such items are clearly marked, often including the Artisan’s initials or other information or a year symbol, and can be readily identified using our Ceramics makers’ marks guide. Additionally, some Delft-ware, particularly those made in France around mid-to-late 19thC, were marked with logos or symbols (usually letters or initials) that are almost identical to those used by authentic potteries in Delft some 200 years earlier and which were by then extinct. These antique French Delft marks are also tabulated and explained in our Ceramics marks guides. 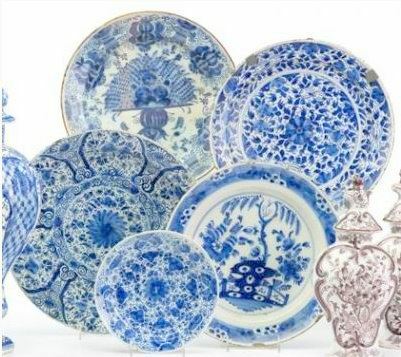 As expected and amply observed in today’s antiques or collectibles market, the Delft style has permeated its reach into objects that are quite diverse. For example, we often see Delft-styled clocks, porcelain Delft figurines, furniture inlaid with Delft-themed porcelain tiles or plaques, elegant chinaware & tableware and all sorts of other decorative or utilitarian items of a distinctly clear Delft flair or motif. Some of these were made ca 19thC, but the vast majority hail from relatively recent times and are often mass-produced. Additionally, these are porcelain, not earthenware like the original antique examples, and have a much brighter sheen and translucency as compared to the original 16 – 18thC Delft specimens. Appraisal values for Delft pottery or Deflt-Ware depend on a few basic specific factors, including age, provenance, size and condition. Since the Delft style is quite uniform, their appeal and beauty is somewhat standardized and most designs are similar, at least at first glance. Our Antiques Pricing Guides contain actual auction sales records of Delft decorative items, both ancient and later examples, and can help in evaluating your collection’s worth or determine current market trends. Some examples are shown below. Wooden Bench with 4 Delft Tile Inserts. One very large and four large Delft plates. An early Delft blue and white plate, 30cm diameter, some chipping. Pair of Delft Wall Plaques, landscapes, rectangular, one as-is.